Every teacher knows that effective parent communication is a key to classroom success. Effective progress reporting sets the stage for home support and student achievement. Before school even starts, layout grading policies and behavioral expectations. Communicate your policies and expectations to parents at the beginning of school. Have parents sign the form or a tear-off strip at the bottom to ensure they have seen it. Reward students for bringing these back to school. Parents and students will understand the expectations you have set for your classroom and will be more supportive when they receive reports. Collect data on any student who is struggling to meet your expectations and policies. Being able to provide data to a parent leaves no room for disagreement. Document who is prepared for class, has done their homework, or pays attention. Use a simple informal tally sheet to document positive and negative behaviors. Keep a simple anecdotal record of observations which you can share with parents, particularly if there are questionable behaviors involved. Collecting data provides the evidence you need to back up your positive comments or negative suggestions for improvement. It has been a pleasure to work with your child this semester. Your child is an enthusiastic learner. Your child is an active participant in class discussions. Your child is able to make good social decisions. Your child tries their best when completing classwork and tests. Your child is able to choose "just right" books that are on his/her reading level. Your child uses various strategies to solve word problems. Your child listens well and shares ideas with others appropriately. Avoid specialized terms and acronyms. While these terms are second nature to the teaching community, most parents are unfamiliar with or don't understand teaching jargon. While we easily understand terms such as "higher order thinking," parents will not specifically understand what you are referring to. Instead, mention how the student thinks outside of the box, is able to understand the author's deeper meaning, etc. Communicate your message to your parents in sentences that are not too lengthy. You can connect thoughts, but make sure both are related. Provide a topic in the first part of the sentence, and add supporting details to the second part of the sentence. Avoid redundant words and repetitious comments. Save your comments in a word document each reporting period. This will build a readily available bank of inspiration and starter comments for you to draw from. Click here for a list of 300 report card comments compiled on the teach.net forum. 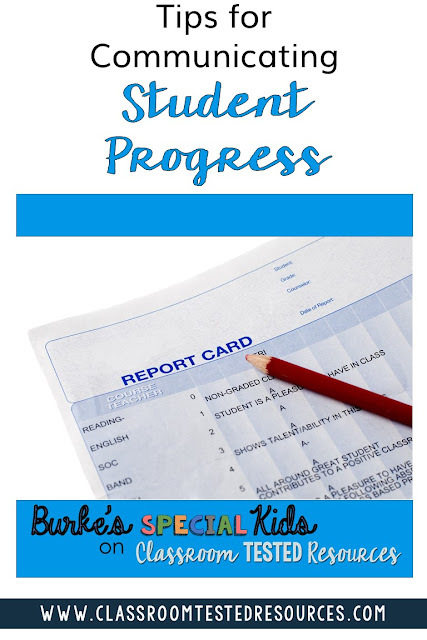 I hope these tips help you as you plan and complete progress reports!